Believe it or not, pain is a good thing. This is your body’s way of communicating with you that, “HEY! Something is wrong!” Pain is never something that you want to deal with, but it does call for action quickly—especially tooth pain. Generally, tooth pain can range from minor sensitivity to severe jolts of pain. It really depends on the cause of your tooth pain and how deep it is affecting your tooth. 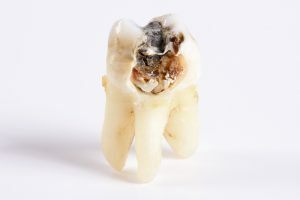 The more your tooth’s pulp (where the nerve endings are supposed to be buried safely) is exposed to the pain-inducer, the more you will experience that unpleasant sensation. Your dentist in Cookville wants you to be aware of the several types of tooth pain you may encounter and what to do if you happen to experience them. If your tooth pain only lasts for a few seconds then you experience relief, you may be in luck. That’s a sign that you may have a minor dental problem rather than a serious one. It could be caused by a small amount of tooth decay, a loose dental restoration, or an exposed tooth root from gum recession. The most important thing to do is keep your teeth (especially in that area) very clean. Brush normally—twice a day with a soft-bristled tooth brush—and use a toothpaste that is specially made for sensitive teeth. If you keep encountering the sensitivity, visit Dr. Sikes as soon as possible. Sharp pain when you bite into your food. You could be experiencing a more severe level of tooth decay. Another possibility is that one of your dental restorations became loose like a filling. If your teeth have experienced trauma like a slight crack, you may start experiencing incidental pain like a sharp pain when you bite into things. As with any medical condition, you should seek help from a professional before it worsens. Visit your dentist before the pain persists. Our dental office can remove the pain-inducing decay, replace your dental restoration, or perform another dental treatment to save your natural teeth. Persistent, unbearable pain and pressure. If you are experience inflammation of your gums, sensitivity, and/or constant pain your tooth may be infected. Consider this a dental emergency, you could risk losing your natural tooth and the infection could spread to surrounding areas. Visit our dental office immediately. You may have to undergo a root canal to clean out the infection and fill your tooth once again, but it could save your smile in the long run. Root canals aren’t anything to fear. We use a combination of sedation and prescribed medication to not only alleviate your tooth pain but fix it for good. In all cases of tooth pain in and around your teeth, see your Cookville dentist as soon as possible. We can give you helpful suggestions on what to do until you can make it to our dental office. In reality, these helpful tips won’t completely solve your issue without the proper dental attention. Feel free to contact us if you have any questions.